The International Council for Coaching Excellence (ICCE) was established on 24th September 1997 by delegates representing 15 countries, during the second International Coach Education Summit at the Wingate Institute in Israel. The guidelines and aims for this new organisation were first established at the 1994 meeting marking the 20th anniversary of Trainerakademie, Germany; and at the inaugural summit in Leeds, organised by the National Coaching Foundation of Great Britain in July 1995. The ICCE has since grown to represent over 30 countries. The ICCE is a not-for-profit, international organization with the mission of leading and developing sport coaching globally. ICCE members seek to enhance the quality of coaching at every level of sport. Every day around the world, tens of millions of athletes run, jump, throw, catch, swim and participate in other sport activities. And every day around the world, millions of coaches help those athletes chase their dreams. The ICCE believes that international collaboration and exchange can accelerate positive change in the realm of coaching development and help these coaches give athletes around the world a chance to pursue excellence. To promote sport coaching as a profession. To promote international relationships, social and cultural, with those who are engaged in coaching education. To promote sport and sport-values. To promote and utilize research in the field of training and competition. To exchange knowledge in the field of coaching. To disseminate information about curricula, qualifying standards etc. amongst members. To co-ordinate coach education courses and resources across member countries. To promote a moral code in coaching. To improve relationships among Coach – Management – Athlete. To publish a professional publication in the field of coaching education. A network of national and international organizations responsible for the development of coaches in their respective nations and/or sport. International accords on coaching issues such as ethics, safety, and knowledge/competency. An international coaching culture that supports the values of Olympism: integrity, honesty, fairness, inclusion, tolerance, and committment to excellence. 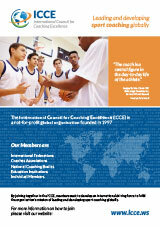 The ICCE is uniquely qualified to address its mission because its members comprise the world’s leaders in coaching development. There exists no other international sports body that focuses on programs for the individuals who introduce, teach, and deliver sport daily-coaches. The Board is responsible for establishing the programs, policies, and procedures of the ICCE.